Shoppers in Solana Beach, California had their first taste of life free from single use plastic shopping bags, and as would be expected the responses from shoppers ran the gamut. Some shoppers simply packed up their purchase in the reusable grocery bags they purchased while others were irritated that plastic bags were not available and paper bags would set them back 10 cents each. Solana Beach is the first city in San Diego County to ban plastic bags and they are following in the steps of 44 other California cities who have already banned these environmental hazards. By some estimates stores in the state of California give out 19 billion plastic bags a year and a mere 5 percent are recycled. At this rate the folks in Solana Beach felt they had to do something and that is how this ban came to be. Those oppose to the ban cited the same laundry list of reasons people against bans typically throw out there. People should be inspired to change, not forced to change. This argument makes sense and it would be great if everyone on the planet felt compelled to change their habits, stock up on eco-friendly recycled bags and reduce their carbon footprint, but that just is not happening and is not plausible. Unfortunately, there are times the government needs to step in and pass laws that not everyone agrees with, but ultimately help neighborhoods and communities. Banning plastic bags reduce the amount of trash generated, so landfills are not overwhelmed. Bag bans also limit litter, the benefits of which are twofold; neighborhoods are cleaner and municipalities spend less money paying staff to clean up the mess. People may not agree with the ban, but no one can find fault with less litter and more efficient use of tax payer dollars. People get hung up on the assumed hassle of purchasing reusable bags and remembering to bring the bags when they shop that they lose sight of the big picture and fail to recognize the benefits. People against disposable bag bans also claim that reusable shopping bags are not safe. The concern is that reusable bags are breeding grounds for all sorts of dangerous bacteria. Anything that is exposed to bacteria and not properly cleaned can spread germs. People should wash their reusable bags for the same reason they wash dishes and utensils and kitchen towels after using them. People clean their kitchen counters and the shelves in their refrigerators to contain messes and bacteria, so this logic needs to extend to reusable bags. Granted it takes more effort to wash a reusable bag than it does to throw a plastic bag in the garbage, but the time and work that goes into cleaning reusable bags is minimal. 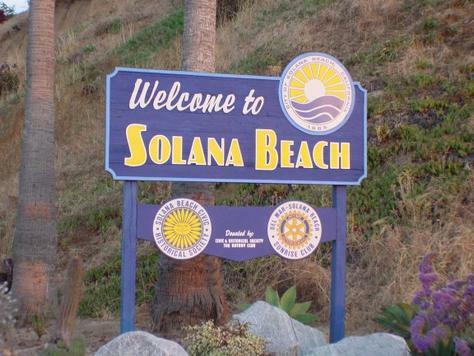 The fine print of Solana Beach’s law permits the use of plastic bags to carry produce, meat and poultry in the interest of health and safety. It is ironic that people would think reusable grocery bags are not safe given that no one knows for certain how safe disposable plastic bags actually are. Plastic bags are not biodegradable, but given enough time they break apart into smaller pieces. Some conditions, like water, accelerate the process of disposable plastic bags splintering into smaller and smaller fragments. These pieces can be found in our oceans where they can be consumed by marine life or these pieces can find their way into water supplies where they are ingested by thirsty animals. Either way, these plastic fragments can easily end up in fish, poultry and cattle and no one knows for certain what this means for animals further up the food chain. There are supporters of the ban in Solana Beach. Sally Fleck, a resident of the area, welcomes the ban. “I think it’s great; it’s going to make people remember to take their (reusable) bags with them,” she said. “It hits them in the pocketbook so it’s going to start training people. It’s just a first step – there are many things we need to do to improve the environment.” Fleck is right. Making the switch to reusable bags in about forming a habit and this is just one thing people can do to make the world a cleaner and better place. It can be frustrating to get to the checkout and realize you left your bags in the car, but over time you will remember to bring them with you. It was not all the long ago that cell phones were newfangled gadgets and people needed to create the habit to bring their mobile phones with them when they left the house. Now people grab their phone without a second thought as they head out the door and given time this will happen for reusable bags, too. When several people make a small change it can pack some power and lead to big results. Making the switch to reusable bags is just one way to help the environment and once people form this habit they will realize it wasn’t so bad and their community is better for this change. To learn more about Solana Beach, California head to http://www.sandiegouniontribune.com/sdut-plastic-bag-ban-customers-sound-2012aug09-story.html.